(CNN) -- Pop icon Michael Jackson, 50, who died Thursday afternoon after being rushed to a Los Angeles hospital in cardiac arrest, had a long history of confirmed health problems, in addition to rumored conditions. 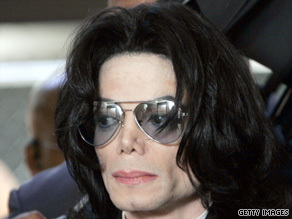 Michael Jackson, seen here in 2005, was taken to UCLA Medical Center in cardiac arrest Thursday. In 1984, Jackson was burned while singing for a Pepsi-Cola commercial in Los Angeles, when a special-effects smoke bomb misfired. He had to have major surgery on his scalp and said that because of the intense pain, he developed an addiction to painkillers. He also was reported to have a form of lupus in the 1980s, but it was later said to have gone into remission. Jackson also had had numerous plastic surgeries, including rhinoplasty and a chin implant. He was also hospitalized with chest pains in 1990 and postponed a concert because of dehydration in August 1993. A concert tour was cut short in November 1993 because of an addiction to prescription painkillers amid allegations of child molestation. During a rehearsal at the Beacon Theater in New York in December 1995, the entertainer collapsed onstage from apparent dehydration and low blood pressure and was hospitalized. While jurors deliberated in a case in which he was accused of child molestation in June 2005, Jackson went to a hospital for treatment of what his spokeswoman said was recurring back pain. He had complained of back problems before. Rumors circulated in December that Jackson was ill and in need of a lung transplant because of Alpha-1 antitrypsin deficiency, a rare genetic condition. More rumors emerged in May that Jackson had skin cancer. But Randy Phillips, president and CEO of AEG Live, told CNN at the time, "He's as healthy as he can be -- no health problems whatsoever." Jackson family attorney Brian Oxman told CNN on Thursday that Jackson's use of medications had gotten in the way of doing rehearsals. "His injuries, which he had sustained performing, where he had broken a vertebra and he had broken his leg from a fall on the stage, were getting in the way. I do not know the extent of the medications that he was taking," he said. Cardiac arrest, distinct from heart attack, affects about 300,000 Americans every year, Dr. Clyde Yancy of the American Heart Association told CNN. Without immediate efforts to resuscitate a person, the survival rate is usually 5 percent to 15 percent, he said. If resuscitation takes longer than three to five minutes, a person could experience profound impairments, particularly neurologically, he said. Beyond five minutes, the likelihood of success falls quickly, especially in older people. Younger people can tolerate cardiac arrest somewhat better, he said.